Ladies and Gentlemen, enjoy and over to Toni! The prophet was something I’d had lying on the shelf half-built for two years, with a loose story story around him. The Invitational came as a perfect excuse to finish him now. The character is based on a John Blanche painting, circa 2012, that he showed me while I was visiting the Warhammer World for the first time. So a pilgrimme based on my own pilgrimage. He kind of came together almost from the warp, in a flurry of plastic and putty. The hard part was ornaments for his staff, and I actually ended up having to buy the Space Marines Master of the Rites specifically for that part. For Ictus, there was also a clear vision inspired by the story. He is this almost Han Solo character, but way older and more 40k. Ruthless seeker of profit, trying to survive outside the imperial law. With really no religion at all, he is only helping the old man because he sees monetary value along the way. The hunched stance of the necromancer and resolute face of the empire greatsword make this guy. He’s seen some rough times, but is by no means close to quitting. The binoculars emphasize he is acting as the prophet’s eyes in the mortal realm. The account book swinging on his right is sign that his only religion is profit. Now the Void vehicle. This is where it got slightly out of hand.. It is imagined as the last resort getaway of Ictus and the Prophet from the Adeptus Astra Telepathica. While it is obviously a weapons platform, it should also be able to generate a psychic charge strong enough to teleport the group onto another system, sacrificing the bound psyker. Somehow they were able to harness Ictus’s illegal weapons dealing network, and build something from the ancient times. And curiously, along the way, all the servitors and overseers working on this happened to perish. And there was a smile on the old man’s face, although his words did not make any sense at all.. It was an extremely fun process putting these together. The much needed kick that was the Invitational has helped me find a new gear. The plan to paint it all on the last week might have been too ambitious though. The colors are inspired by the Adepta Sororitas codex cover and the Mad Max: Fury Road trailer. There will most definitely be more to the warband and the story soon enough.. I was talking to John about this yesterday; I’m so obsessed with that Prophet. Amazing work, Toni. What an opener to the Invitational, too. Congratulations! My god this is amazing! Fabulous stuff. 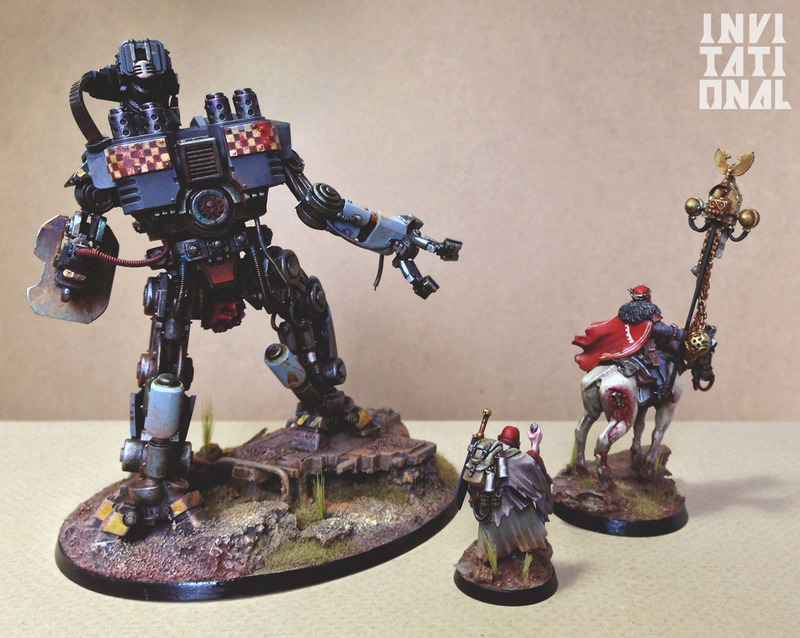 The conversions are beautiful enough, but the painting takes them to a whole other level. I’m gobsmacked! Gobsmacked indeed and yes fulgrim man of sorrows …..
Wow! This stuff looks amazing! The Void Vehicle is my favorite! The prophet was one of the standout miniatures from the WiP round for me and now I think it will be tough to top it. Tommy, if you could get us a BOLS feature, now would be a perfect time. There is a ridiculous amount of goodness coming up!! They’re all amazing, but I think that Ictus is my favorite of the group. The choice of base figure, the little details, and the posing of the whole thing really give a strong sense of character to the model. It genuinely looks like the figure is struggling beneath the weight of his pack, and is leaning on his staff for support. Well done. Like a Kopinski drawing come to life. The prophet is going to be hard to top. Cheers! I did look at a lot of Kopinski drawings during the build and paint. Glad that some of it might have stuck! Absolutely wonderful. Such great painting! I love the rich warm grey on Ictus’ robes and the Prophet’s horse. It’s also great seeing a cavalry model in a group like this, a preacher on a genetically altered / rad-burned horse in a gas mask is such a wonderfully 40k image. A fantastic trio and such a suitable opener for this great endeavour. Funny how there are so many things in common with mine and Toni’s entries – Great minds think alike. Wonderful collection, the hydraulic bionic infused into the leg on the horse is a fantastic touch. Painting is top notch, really nice weathering, the blood spattered checkers on the rear of the Void Vehicle are great. 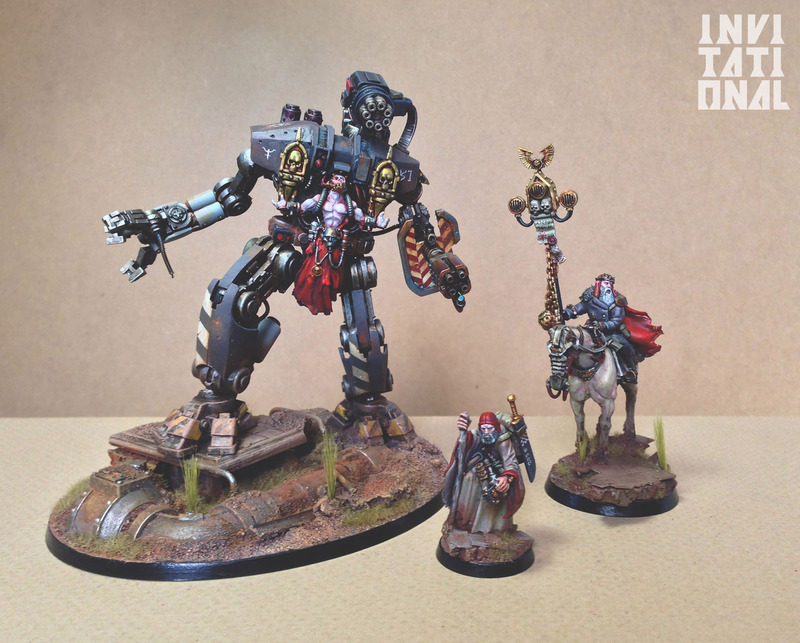 I love seeing Warhammer models and bits used in 40k/Inquisitor… you’ve done an exceptionally subtle job on the Prophet. Toni, this is fantastic work. Very clearly a revolutionary piece for you, after which no other miniature will ever be the same again. Congratulations and thanks for such incredible contribution. Cheers everyone! You’re right about the next miniatures.. A strong narrative helps in crafting characters into a fantasy world. Really looking forward to this nonstop extravaganza. I think you nailed it in terms of schedule with the invitational. Simply beautiful.. the crown of thorns and the prophets expression .. sublime..
Incredibly evocative and characterful models! I love what you have done with the blind Prophet; your work on his face and jacket are fantastic. The reds have a wonderfully deep and vibrant tone to them. The blood running from the wounds on the Prophet’s steed are a great detail too and really add to the model. Also, if you painted all of those models in a single week, I am beyond impressed! I can’t wait to see more models to accompany them! Wow, the Prophet is certainly one of my favorite 40k models I have seen in a while! He seems very distinct and distant from standard 40k tropes, yet fits within the universe without question. I particularly love the double-breasted coat. The aire of mystery surrounding the model is astounding. I cannot wait to see more! Very nice to hear! Especially since all of what you said is so deliberate. I looked into victorian british fashion and current FW Krieg line for the styling, as well as JB’s piece that set him off. Might be doing a revision of him once the story progresses.. The Void Vehicle is awesome. Big. And painted in time. Cudos! But the Prophet is incredible. I love the crown of thorns and what could be a subtle reference to JRNs Duchess Death. Previous Post The Invitational Cometh!